Today we started off today with something great. We went to the center and gave all he kids their letters and photo albums from classes, businesses, and sponsors in the US. We did it 1 by 1 and it was really special to see the kid’s faces light up when they received a personalized item like that. I can just imagine them in their beds at night looking through those albums and reading the letters over and over. It really gives them a sense of worth; something that they have never had. We hung out at the center until about 12:30 and then headed out to Kroo Bay to try to open the doors up in the community by partnering with TRS so we could help their kids. I have never seen anything worse than this place. We thought we saw some hard sights the other day, but they were nothing compared to this place. It is a literal trash dump that refugees settled on after the war. It is at the bottom of the hill where all the trash and sewage run through from the city. There are thousands of people that live in this horrible place. We saw children with nothing on but a dirty pair of underwear scrounging through a river of filth alongside pigs trying to find anything that could help them survive. You will just have to see the pictures to understand. I can’t put in to words how bad off these people are. I didn’t think anything like that was possible. We walked through the city to get to the tribal chief’s meeting area where we met him and the community council. 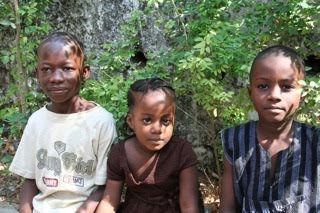 Quami talked with them about TRS and how they wanted to partner with them to help their children. The team last time received a hostile greeting from them last time due to a lot of lies that had been spread. We had a member of the council apologize for their actions last time and we thought things were going to go well from there, but then a member of the council shared some frustrations with us and things got a little tense. He told us about some white people who came into the area a while back and took a lot of pictures and made a lot of promises, but it has been a year and Kroo Bay has not received any help from that. They were frustrated because they have to try to explain something like that to their people. We told him that we understood his frustrations. Quami did an excellent job saying that our group was different, he can see that since Osseh and Quami are speaking for us, and that any of the council members can come visit the covering anytime to see where their kids are going. This put them at ease and they agreed to partner with us and let us take some pictures to tell their story. We then followed the council through the city down to the soccer field where we gave the kids a new soccer ball and about 300 suckers. They were so excited that we had a hard time not being run over by the mob of kids. These children were in really bad shape. It was really uncomfortable being there. Not because we were out of our comfort zones because those have been removed by now. We got a lot of angry looks from the people and I felt really bad taking pictures of everything. I just held my camera down by my side and took pictures discreetly. I just kept telling myself that I needed the pictures to tell their story. The kids we saw there are why we fight. We left Kroo Bay and headed to our meeting with the Social Minister, but he was meeting with the Vice President. We are going to try again on Friday, but that will be our only window before we leave so please continue to pray that God will open that door. Since he was not available we headed over to visit a great man named Edgar who works for an Evangelical group in town and has been a huge asset for TRS. After talking with him a while we went and ate at Crown Bakery downtown. We then headed out to the center for the rest of the night and what an experience. We just got to play with the kids for a while. We played soccer, drew pictures, wrestled with the kids and just held them. I love having those kids crawl all over me laughing. It was a joyous time to have them all laughing and playing after going to a place like Kroo Bay. It is amazing to see these kids transform. Some of them were in places like that a few weeks ago and with a little food, medicine, love, and attention they become kids again. Thank you to everyone who fought for these kids. After we were done playing I experienced one of the greatest nights of my life. The kids had their nightly worship time. By that time it was dark and there was only a small lamp to light the room, but all the kids circled up and Augusta led them in songs and prayers. They sang songs about coming from the depths of despair and now Jesus is their joy. They sang a song about how much they love their Papa (God). Two things from God’s word came to mind while worshipping with these children; first that Jesus dances over us. We were all dancing before the Lord and I can just picture Jesus dancing over us during this time. The second is that Jesus delights in us. I never really understood this fully until I had children of my own. I truly delight in Levi and Ivey and they fill my heart with joy. I was thinking that God truly delights in these precious children while they lift up this pleasing worship to him. These kids were praying and singing their hearts out to God. What a convicting and wonderful experience. It was a really good thing that the room was almost dark because the majority of our team, me included, were weeping with joy while sharing this pure worship with these kids and because I would have been embarrassed if these kids were able to see the dance moves I was rocking. I was reading in Revelation that the saints follow the Lamb wherever he goes. Thats what we are doing; we are letting him lead and saying here are our hands to carry out your work. I wanted to share a short story. A young woman came to the place we are staying this morning to talk with Tina about financial help to go to the University. You could see the passion in her eyes when she talks about that opportunity. What courage it must have taken to ask us. There are no scholarships over here and no opportunity to raise the money yourself. She even wants to go to IT school because she sees that computers are going to be the up and coming thing in Sierra Leone. She is doing this all on her own and to see her try to improve her situation like that was touching. 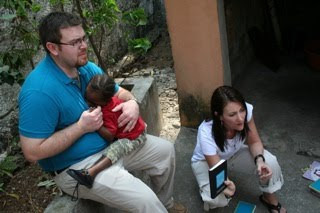 The young woman is Olive who is the daughter of the very very sick woman we went to visit in the TB hospital. She is Sam, Betty, and Fallah’s older sister. I wanted to share that with you so that if there is anyone out there who feels called to help her you would know of this opportunity. Ok that sums up today so I am going to take a second to be selfish and talk about our sponsored kids  since this is my blog, hah! I loved loved loved getting to play with them today. They are really warming up to me and the oldest especially seeks me out whenever I am there. When we came back tonight he was asking about some of the things in the pictures from the album we gave him. He told me that I had a fine son. I got to play soccer with him for a second and he is really stinkin good. He has such a gentle spirit and smiles constantly. Whenever I am standing around talking and I feel a hand slip in to mine it is usually his. His brother finally opened up a little more today and I got to sit with him while he drew a picture today. He traced his hand on the paper and when I sat down I asked him if it was his hand and he said, “No, it is your hand.” I got a chance to hug and tickle their little sister. She can light up a room with that laugh. Tomorrow we get to play with the kids for a lot of the day, visit Wellington orphanage, and participate in an Intake process. An Intake process is where the social worker from TRS, after an investigation to make sure the child is qualified, goes out and picks up the child and their belongings from the place they live and takes them to the Covering. I can’t wait! To see a child transform right before our eyes is going to be amazing. I can’t wait to see their face when they get to see their new home and how much the other kids are surrounded with love and attention. Sorry this is so short. Maybe I will have more to say tomorrow. Andrew I love you! I am honored to be your wife. Hi Andrew....Rudy here and I am bawling my eyes out as I read your posts, both in joy and sorrow. I think I shall see your "high kicks" in a different light now for it will remind me how Jesus dances over all of us. Your story about the young woman, Olive touched my heart and I would like to know more on how to help her. The story of the traced hand....so precious. Praying for you constantly!!! This is so amazing! I love seeing God work in your heart Andrew. He is doing mighty things! Know that you are being lifted up! We can't wait to hear more! Thank you for sharing all of this! I cry everytime I read a post! And whenever I read a post I find myself wanting to be over there loving on those kids as much as possible! This is all so amazing and I love how God is opening up doors for the team! We'll be praying for the meeting with the Social Minister.